This weekend Switzerland celebrates its 720th birthday. Every year on August 1st, the Swiss gather with their families, raise the flag, fire up the barbecue and shoot off some fireworks. They sing traditional yodeling songs, dress up in funny clothes and celebrate their unique identity, culture and language. A specimen of Homo Helveticus in traditional celebratory garb. Hm. Kind of like we do on July 4th. And though I cannot with a good conscience completely disparage my life here (it has its merits), and with all due respect to my Swiss friends and readers (they are great folks to have around), an incident last week once again made me wonder what the hell I ever did to piss anyone off in this tiny insignificant piece of overpriced real estate at the center of Europe. Other than live here and breathe air. Well, I thought. So much for friendly natives. I responded that unfortunately I could not send her the report, and that she wouldn’t be able to read it anyway, because it was only published in English, and not in her Zurich dialect of Swiss German or Swahili. And I hung up. So this coming Monday, while four million German-Swiss wave their flags and proclaim in their myriad of dialects how wonderful their country is (and three million more doing the same thing in French, Italian or Rumantsch), I will quietly enjoy a day off work, a month late. We will surely also raise the Stars & Stripes, fire up the grill and light a sparkler or two. Do me a favor and pass the steak sauce and the Miller Lite, will ya? Do you have a post on how you ended up in Europe? I would be interested in reading it. I have poked around a bit, but I thought it would be easier just to ask. Hi there Marianne – thanks for stopping by! How I got here? Hm… no I don’t think I do have a post on that. But it’s a great suggestion, thanks! Stay tuned! In a nutshell – it’s all kind of ancient history. It was 1992 and I was fresh out of graduate school, there was a recession that had me unemployed, and I took off to find a new life. That’s pretty much it. 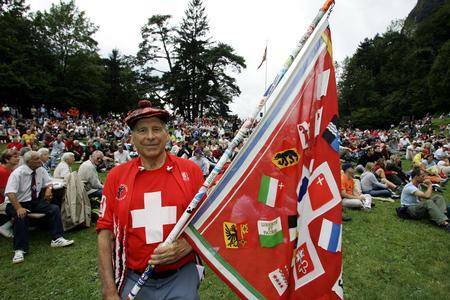 You could always leave Switzerland you know…..
You are absolutely right, I could.